We love the low price and all-natural formula of these granules. With an intense blend of potent oils, this is a strong repellent for both snakes and some of their food sources. This is our favorite spray for its natural yet powerful formula. Best for people in sunny regions. We love the ease of use of this product and combining it with other repellents. Venomous snakes that can be found in several regions around the United States include rattlesnakes, cottonmouths, water moccasins, copperheads, and coral snakes. These snakes can be dangerous to outdoor workers such as painters, farmers, gardener, and construction workers. In heavily-infested snake regions, they are also a risk to hikers and even around homes. Although rare, some people with a severe allergy to snake venom are at a lethal risk if bitten. It’s estimated that around 7,000 to 8,000 people year receive venomous bites in the United States every year, and approximately five of those people die. The number of deaths would be far higher if those bitten did not seek immediate medical care. So, we’ve hand-selected our favorite snake deterrents to keep them off your property without the issue of handling poisons or traps. Havahart Dr. T’s Snake Repellent Hose End Spray (32 ounces) is a potent formula of proven essential oil repellents in a concentrated blend. 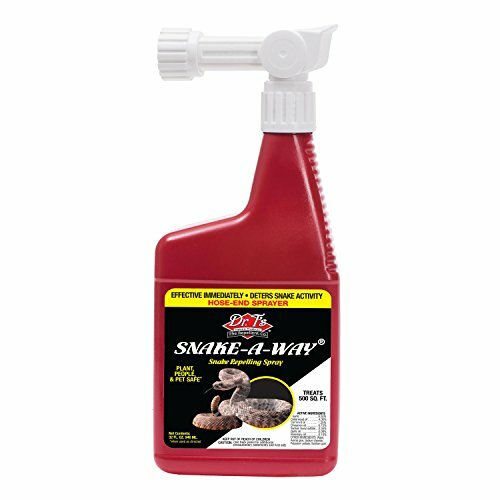 It utilizes seven active ingredients to deter snakes and other pests from your property. To use this spray, attach your garden hose to the head of the bottle’s sprayer and apply where you have snake activity or areas of snake food sources, such as mice. You can also use this deterrent as a perimeter treatment spray, which creates a barrier around your home. This spray works by unsettling a snake’s sense of smell to disorient them, so snakes slither away to find fresher air. Just use caution around prized plants, as this formula can burn leaves if sprayed on heavily. Active ingredients: concentrated garlic, cedarwood oil, corn mint oil, cinnamon oil, sodium lauryl sulfate, garlic oil, and rosemary oil. 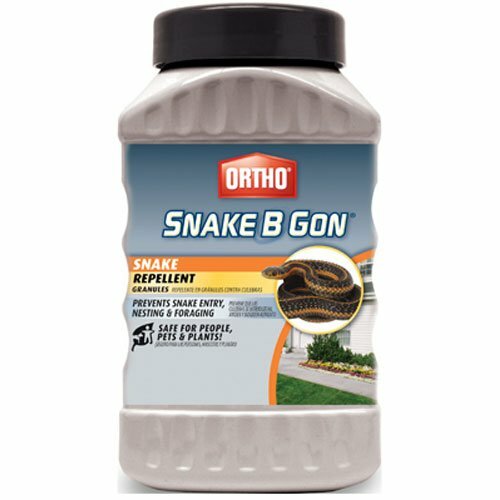 Ortho Snake B Gon™ Snake Repellent Granules work by way of overwhelming a snake’s sense of smell, so it can’t smell potential prey. Snakes will move on to areas of fresher air to hunt and eat. This product is non-toxic and made from a robust essential oil blend. These granules are super easy to use: just open the lid and shake them around any area you need repellent. These granules are also safe around plants and pets. We found it helpful to apply copious amounts, especially in snake-prone areas, and even dampen the pellets a tiny bit to help activate the scent. We love these granules for gardens, near garages, and around areas mice or other snake food sources might be active. The Vekibee Pack of Six Ultrasonic Pest Repellents works by emitting ultrasonic pulses into the ground where snakes like to hide in tunnels. Snakes find it agitating to their nervous system, in theory forcing them to find another home. Human ears are unable to hear these ultrasonic repellents. Each spike is meant to cover around a 100-foot radius. However, we found overlapping the frequency range of each repellant can help improve their effectiveness. These are definitely best for people in sunny regions or without much shade in their yards. 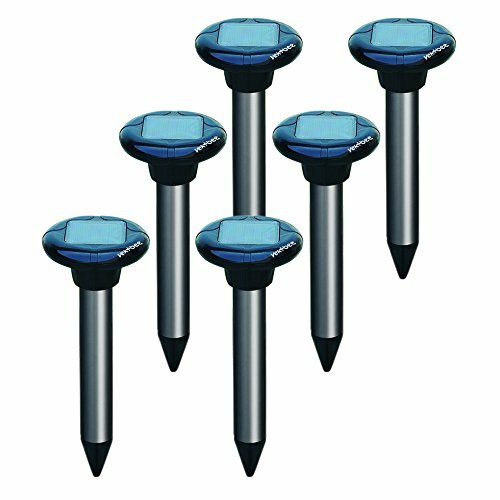 The solar power of these stakes makes a difference in the success rate if they don’t get a substantial charge from the sun. You can always double up on deterrent methods for maximum effectiveness. There are around 3,400 types of snake species, but the (somewhat) good news is that less than 400 species of snakes are venomous. All breeds of snakes are carnivores. However, their specific diets will vary with each species and their habitats. Snakes are opportunistic when it comes to what they eat. When anything consumable for them is available, they will often take advantage of it. A Snake’s food sources vary, naturally, with its region. Some snakes will eat a few times a week, while other breeds will eat only a few times a year. Since snakes are rarely super active, they do not require a lot of food to survive. Snakes are most lively when the temperatures outside are mild—neither too hot nor too cold. In regions with cold winters, they will brumate—or go into a state of near-hibernation where they will awaken but remain inactive. Signs of Snakes in the Area? If you do to see a snake, it will most often be in warm seasons when they are most active. Gardens with extensive wildlife will often harbor more snakes. In most yards, if snakes are spotted, they are usually just passing through unless there are places for them to hide exceptionally well. There are a couple more in-depth signs that you can look for if you are concerned about snakes. These include finding shed skins and winding trails. Snakes will often molt their skins very soon after surfacing from brumation. Winding paths, like prints from footed animals, on any light dirt or sandy surfaces, can be evidence a snake slithered through. Along with using any of the products we’ve mentioned, there are some additional ways to make your property less inviting to snakes. Mow your lawn regularly to keep it short—this gives snakes less depth to hide in and will appear as a more dangerous, open stretch of land for them to cross. Clear or trim low-to-the-ground plants or shrubs that provide hiding spots for snakes. Remove rocks, lawn debris, and wood or log piles as these are excellent hiding spots, as well. Keep compost piles in a sealed bin, not on the ground where critters can invade. Fill in holes that a snake can hide in, such as those under sheds, patios or decks, and around walls. Also remember that an infestation of a snake’s food sources such as mice, rats, chipmunks, frogs, and excessive insects can attract snakes to your property, too. Keeping these animals in check in your area is essential. You can always double up on deterrent methods for maximum effectiveness. For example, we liked the ultrasonic repellents combined with the spray. The ultrasonic devices not only keep snakes at bay but also small rodents they might hunt. Mixed with something like the spray or granules, you are making your lawn extra unfriendly to snakes, while still keeping it free of toxins, environmentally friendly, and avoiding the hassle of traps.